And so we return back to Dubai. How could we not? Archinect started the ball rolling last week when someone asked, “Is Dubai the city of the 21st C?” Mostly inconsequential responses from the lot, unfortunately, except maybe from the pseudononymous “anti”. S/he answers with a question: “How is this any different than Shanghai?” Indeed, questioning its premise, presumptions, proposals, prognosis, and prospects seems to be the only possible response. Can Dubai sustain such massive construction? Will Dubai become a model of a post-oil Middle Eastern economy? Is it the future? And why Dubai of all places? Why a seven-star hotel? The world? The palms? A pyramid? Who would want to live in a pyramid? Will there be enough people clamoring to live in the world's tallest building, a very tempting target for bomb-laden planes, trains, and automobiles? And where will these people come from? Will the palms bifurcate into fractal self-similar patterning, sprouting or defoliating in response to the global real estate market? Will the bubble burst, sending British investors and Malaysian migrant laborers back home destitute? Will the sand then creep back in, smothering the refrigerated ski slope along with its Swiss chalet? Will someone write another Ozymandias? And then, only when it becomes an archaeological ruin to rival Luxor and Pompeii, will it become the prime tourist destination in the late 21st century as it was meant to be in the early 21st century? Anyway, back to Archinect, the gems of that thread are the links. For instance, one link takes you to this article by Mike Davis from TomDispatch.com: “Welcome to paradise. But where are you? Is this a new science-fiction novel from Margaret Atwood, the sequel to Blade Runner, or Donald Trump tripping on acid?” And this article by George Katodrytis from Bidoun. Another one directs you to sinkingSands, a blog: “Real-estate soup anyone?” “You want more?” “Who's gonna buy all these houses?” “Vested interest in interested rates?” Huh? And there's a link to this, from which all these photographs, by Brian J. McMorrow, were lifted. Meanwhile, the Los Angeles Times had something to say about all these zaniness. 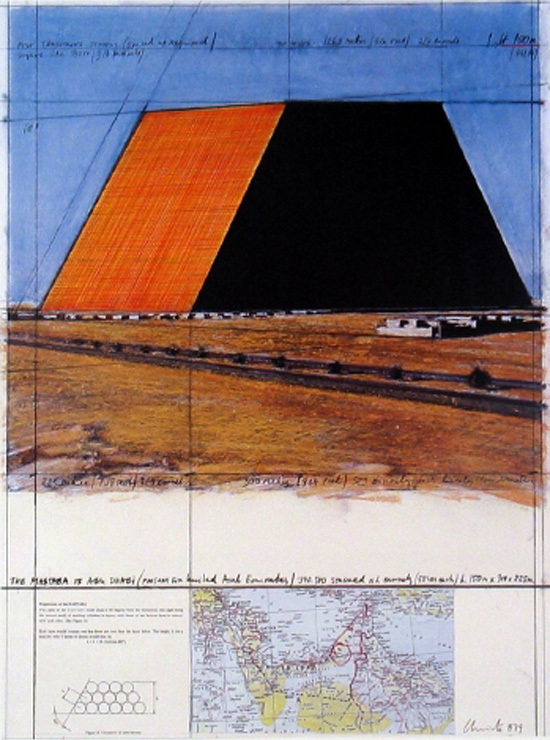 And then Christo and Jeanne-Claude will anoint it as the new Paris x Berlin x New York with 390,500 oil drums. They will install 10 mastabas. Obviously. And now we come to The New Yorker. 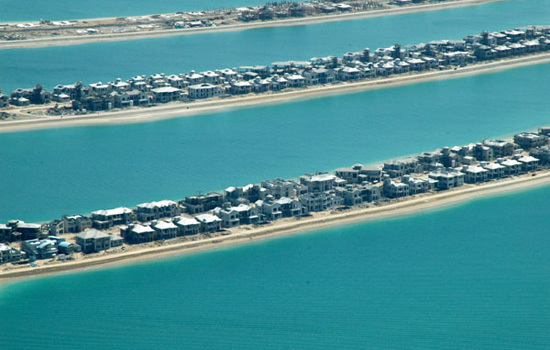 The article is not online, but for a taste, author Ian Parker discusses “the architectural weirdness of Dubai” online. It's very strange and ironic to realize who did the master plan for The Palms. molly, how is it strange and ironic? And thanks for the link! Why strange and ironic? 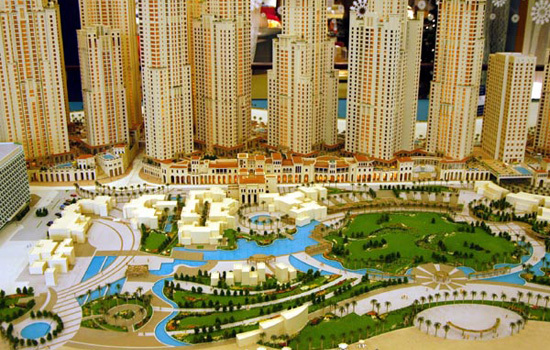 For several of the reasons that both Dubai and New Urbanism are strange and ironic. The Calthorpe mythos is one of Berkeley crunchiness, of do-the-right-thing regional planning, of we're-not-DPZ West Coast brand New Urbanism. When you consider all the tenets of New Urbanism and the kinds of things Peter Calthorpe talks about, it seems greatly surprising that the firm would also do extravagant planning for one of the most over-the-top developments in a city more opulent than Vegas. The PDF that Calthrope published says that the Palm Deira is essentially a transit-oriented development on an often walkable scale, with natural cooling and light and an efficient infrastructure. This makes me wonder a few things. Who put in that efficient infrastructure? 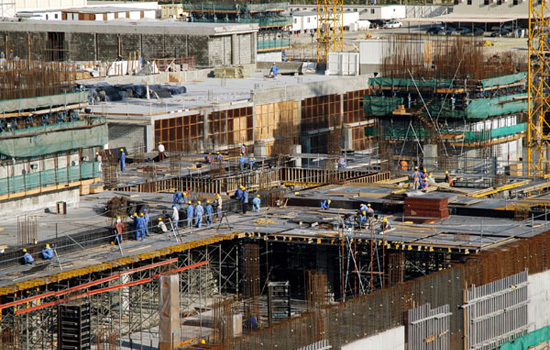 Dubai has a human rights problem with its foreign workers, the necessary people who construct the Dubai the world sees, and who are typically paid and accommodated poorly. The construction companies illegally hold passports so the workers can't leave. Do the other master planned projects Calthorpe does take place on such a backdrop? 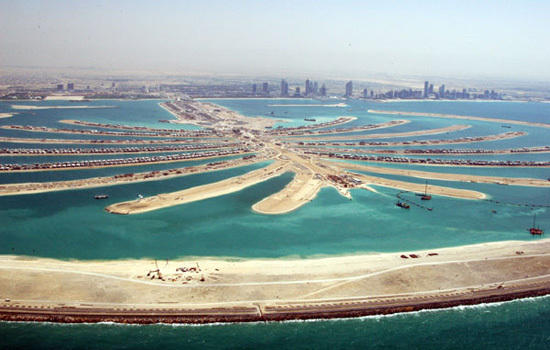 Finally, the whole project is a massive "reclamation" of land from the sea. On one hand, Calthorpe's plan talks about natural cooling and other environmentally-friendly moves. But such a reclamation (the total awesomeness of suction hopper dredging notwithstanding) surely cannot be a kind move for the environment. It's completely over the top. So. All these things? Strange and ironic. I remain fascinated and sickened by Dubai, as I am with New Urbanism. And I've lost some respect for Calthorpe in the process. Molly, what did you mean by saying that Calthorpe is not a DPZ West Coast brand New Urbanism? Thank you. The people who are building the new Dubai are the children of dwellers in homes made of mud brick. ...to randomly shift gears, just some scattered thoughts, storytelling and commentary sure to make anyone reading it wonder why my brain works the way it does. I've been avidly following the progress of Dubai for a few years now, silently obsessed with how ambitious every aspect of its growth truly is. I live in Seattle, WA, in the United States. My interest in this actually began when I met a resident of the UAE, whom attended college here in Seattle in the mid 90's. He finished school and suddenly moved home, instantly ending our friendship. So, as Dubai's ambition began to burst, what with its sprouting skyline and sudden call for attention, I took particular notice, probably because of my friend who lives there; or should I say "my former" friend? I'm not sure why there was only one phone call to each other after he left, because we grew quite closely to each other. I guess my main comment is this. I'm totally fascinated with this city. It's incredibly ambitious (there's that word again). I've seen stories on 60 minutes, The Discovery Channel, etc., about the amazing things already accomplished and in the works. I've seen several, nameless, short documentaries, seemingly catering to my interests about all of this. I can't get enough. Perhaps it's becaue of where it is. Maybe it's because of the current state of the world, and how Americans view the MIDDLE EAST. Maybe I'm just hoping for something profoundly different to call attention to the Middle East? 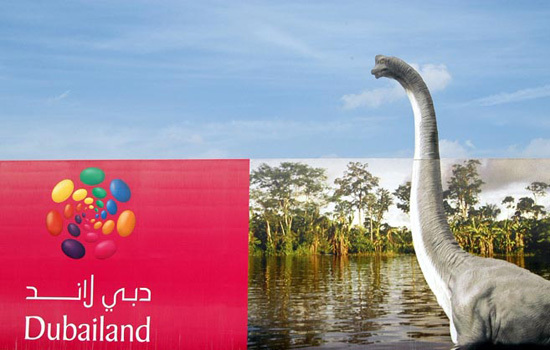 Maybe Dubai will be that spark which change the way of thinking in that region of the world. And NO, not to more of an American way of thinking, but simply something different... and the people of this little country should be very proud of themselves for drawing so much attention to themselves for reasons different than radical terrorism and promoted hatred for the so-called infedels of the world. There, was all of that random enough for anyone really reading this?